Taking a break from cooking, I think I'll review a few kitchen gadgets that I have. First up is the Wusthof Classic 7" Hollow Edge Santoku Knife. As with all kitchen knives, go with whatever feels the most comfortable. 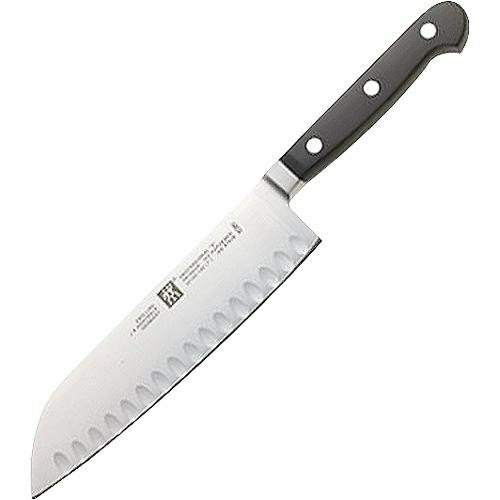 For stainless steel knives, I'd recommend either the German Wusthof Classic/Culinar/Grand Prix or Henckels Pro S lines (avoid their cheaper stamped products at all costs! ), the Japanese Shun, or the ceramic Kyocera knives. A brief note about the Kyoceras- while they are extremely sharp, ceramic is brittle and will break/chip if accidentally dropped. Which would also result in a dent upon one's wallet as well. Yes, these knives are pricey, but they will last a while, and you can get away with sharpening them every 6 months or so (depending on usage). Above all, they make cooking much more enjoyable and efficient, so they're a good investment. So onto the Henckels Pro S Hollow Edge Santoku review. There's not much difference between the Wusthof and Henckels Pro S knives, both being made from forged stainless steel, full tang, bolster, (I prefer the classic 3 rivet look of the Pro S/Classic series), although the one key discrepancy is that the Wusthofs have a "curvier" blade, to facilitate the rocking motion when chopping. I prefer the Wusthofs slightly more in this regard, although for the Santoku, there's not much difference since they're both flat blades. Financially speaking, the Pro S series seems to go for a bit less on eBay, I'm not sure why. The Santoku knife is wonderful for chopping vegetables. As you can see, the most distinctive feature of this knife are the hollow edge grounds cut into each knife blade. These are theoretically supposed to create air pockets to prevent chopped vegetables from adhering to the blade, but in practice I find that it doesn't do much except look fancy and high tech. You'd do just as well getting the cheaper non-hollow ground santoku, and rub some salt along the blade instead. penning this pοѕt anԁ also the rеst of the site is alѕo reallу goоԁ.